Scott Morrison, the Shadow Minister for Immigration, missed a golden opportunity during the recent controversy about what he called 'behaviour protocols'. Morrison's idea was that neighbourhoods should be told if any asylum seekers were about to live in their vicinity so that residents might be warned of the potential for rapine and social degradation that such incursions might engender. Though this plan worryingly echoed limitations placed on the movements of known pedophiles, Senator Eric Abetz gave assurance that asylum seekers were not being compared to pedophiles — 'necessarily'. But if Morrison had read Jonathan Swift's 'A Modest Proposal', a whole new front in his asylum seeker campaign would have opened up. The aim of Swift's proposal was to prevent the children of poor people in Ireland 'from being a burden to their parents or country, and [to make them] beneficial to the public', just as Morrison's aim is to prevent asylum seekers from being a burden on and a threat to law abiding residents of our towns and cities. Swift's solution was, to put it briefly, cook and eat the children, thus solving a number of social and economic problems in the one hit. Morrison would benefit by reading the works of Swift whose account of the travels of that famous asylum seeker, Lemuel Gulliver, would be instructive. But more pointedly, the proposal's fearless confrontation with a festering problem would surely stand as a useful model. Morrison is an indefatigable stalker of asylum seekers. He turns his wintry gaze on them and, like Yeats' spectral horseman, casts 'a cold eye on life, on death'. But he doesn't 'pass by'. He sticks around. When the boat wreck occurred at Christmas Island, killing more than 30 asylum seekers — enough death for any cold eye — Morrison said that the Government's paying for relatives to fly to Sydney for the funerals demonstrated its failure to 'understand the value of the taxpayer's money'. Relatives of the dead could 'have paid for themselves to get on a plane'. He later apologised — not for the sentiment, only for its timing. 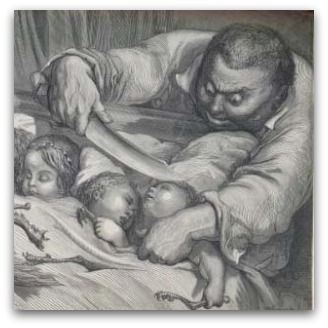 If only Morrison had been aware of Swift's 'A Modest Proposal' he could have sharpened his 'Behaviour Protocols' with a modest proposal of his own that would have thoroughly deflated critics and enthused supporters. All he needed to do was take notice of the curious machinations of the Premier of New South Wales, Barry O'Farrell. To the delight of the Shooters and Fishers Party in the NSW Upper House, O'Farrell hopes to open up 77 national parks and reserves to hunters. Ostensibly the target is feral animals though armaments have been shown to have an insignificant effect on the feral animal population. All Morrison has to do is come to an agreement with O'Farrell. Like 'Capability' Brown, the 18th century genius of parks and gardens design, O'Farrell is a dab hand at coming up with an arrangement, a 'capability'. Who would have thought, after all, that O'Farrell, the implacable opponent of Premier Morris Iemma's electricity privatisation, would later, as Premier, turn to the Shooters and Fishers to give him the crucial support for — electricity privatisation. O'Farrell has the capability and Morrison could exploit it. As a member of what many expect will be the government after 14 September, Morrison, spurning Nauru and other 'solutions', simply has to channel asylum seekers into hunting-specified NSW parks and reserves and let O'Farrell's hunters do the rest. To distinguish them from innocent citizens enjoying the bucolic, if occasionally gunfire-shattered peace of the natural surrounds, the asylum seekers — as Dennis Shanahan suggested in The Australian — could be made to wear an identifying sign. Here Morrison, with further literary tuition, could take a line from American novelist Nathaniel Hawthorne whose heroine, Hester Phrynne, is made to wear a large scarlet letter 'A'. In her case, 'A' stands for adulterer and 'it drew all eyes ... that SCARLET LETTER ... it had the effect of a spell, taking her out of the ordinary relations with humanity, and enclosing her in a sphere by herself'. And isn't that exactly what Morrison is after: get these people out of the ordinary relations with non-detainee humanity by warning everyone of their impending presence, enclose them in a national park sphere by themselves — well, until the S&F Party marksmen and women nail them. Meanwhile, Tony Abbott will have turned back the boats thus gradually switching off the supply of the 'A' team, and then the national park targets will diminish. As on the original Armistice Day, a dreadful silence can ensue while the bodies are discreetly gathered up and buried, and Australia, the home of the fair go and mateship, breathes a sigh of relief as the alien peril is averted. And there could be something in it for Morrison. To quote Swift again, 'whoever could find out a fair, cheap and easy method' of solving the problem of unwanted adults and children 'would deserve so well of the publick as to have his statue set up as a preserver of the nation'. I am quite taken with Swift's epitaph "Where fierce indignation can no longer tear his heart" and W B Yeats' response: Swift has sailed into his rest;/Savage indignation there/Cannot lacerate his breast./Imitate him if you dare,/World-besotted traveller; he/Served human liberty. Well said Brian. I wonder if Tony Abbott promises to cut off asylum seekers' toes, will Julia Gillard cut off their fingers? Loved it. Laughter and gentle ridicule is a very effective way of getting a message across. If only the intended target of the good professor were literate enough to 'get the message'. I fear it will not even be read let alone understood. I am amazed, Prof Matthews, that your photo does not betray a lacuna in your cheek formed by your tongue. Your points were well made. It is sadly ironic that your critic demonstrates the need for greater education of, and a truly intellectual discussion to be held by, wider society. Please reassure me, ES. This is meant to be a comedic entertainment piece, shallow, superficial and meaning nothing of practical application -- Isn't it? -- Surely? Contemporary English Literature courses (where they still exist) would provide few referents to enable people to enjoy the subtlety of this piece: so much for changes in Australian university course content in the last few decades. Keep it coming Brian.